Do you have an Impacted Wisdom Tooth? 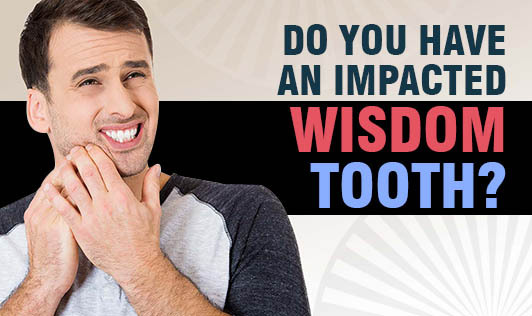 Impacted wisdom teeth are third molars located at the back of the mouth that don't have enough space to grow normally, and generally do not erupt completely out of the gum line. Wisdom teeth are generally the last adult teeth to erupt. Many people have four wisdom teeth at the back of the mouth, two on top and two at the bottom. Impacted wisdom teeth can result in severe pain and harm to other teeth. In few cases, they may cause no obvious or immediate problems. Since they're hard to clean, they may be more susceptible to tooth decay and gum disease than the other teeth are. Wisdom teeth usually emerge between ages 17 and 25. Some people have wisdom teeth that emerge without any problems and line up quite normally with the other teeth behind the second molars. In most cases, the mouth is too crowded for the third molars to develop normally. When an impacted wisdom tooth is infected, it may cause other dental problems. One may experience some of these symptoms. See your dentist if you experience severe pain or other symptoms in the area behind the last molar that may be linked with an impacted wisdom tooth!